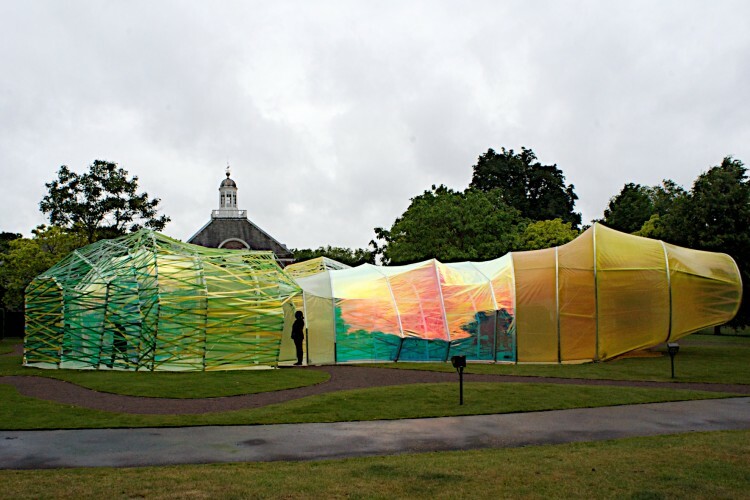 Spanish architectural studio Selgascano have brought a psychedelic play with colours and materials to the Serpentine Gallery lawns. The new Summer Pavilion, which opened this week, is the fifteenth commission in the history of the pavilions and one of the more controversial designs in recent years. Expectations rise each year and the unusual mix of artisanal and techno can seem confusing, especially here as the most highly finished attention to detail has been the norm. The rainbow-coloured materials, stretched over the irregular pavilion structure, play with reflections even under grey skies. But it’s inside when the sun hits the surfaces, where the play with light really comes alive. José Selgas, who partners in the Madrid office with his wife Lucia Cano, says colour is just the outcome of their creative process where they try out different materials: “We don’t care about colour, we just play with absolute freedom”. Cano talks about the engineered plastic ETFE material they used in two layers here: ”We have used it before, but in a very different way. Here we did experiments, we added the colour and the mirror effects.” Their approach is playful and dressed in youthful outfits with matching colour-coded details together they embody the new generation of architects. They explore materials, forms and technological possibilities, pushing the boundaries of how architecture is perceived. And that’s certainly what the pavilion is and should be for. The couple have been working together since 1998. Selgas says they feel a strong connection to the Spanish architectural heritage, although in the pavilion design they wanted to acknowledge the fourteen works by the previous architects. He explains their contribution is part of a longer process where each architectural design communicates with the others. “It was important to do something different” he says. “We love the artisanal, the handcrafted touch and we didn’t think that it would be possible with this kind of commission, where it would need to be prefabricated. But we have been able to experiment “. For Selgascano the pavilion is a work in progress, which will be in London until October, then dismantled and moved elsewhere. The sense of fun makes up for some of the flaws, although the architecture establishment might not be entirely convinced. But as José Selgas points out the pavilion concept is in a stage of transition and will evolve and change: “It’s the starting point for the next period”. Maybe in the future there will increasingly be young emerging talent with experimental ideas to further challenge the norms of the architectural community.